New firebird in the nest! 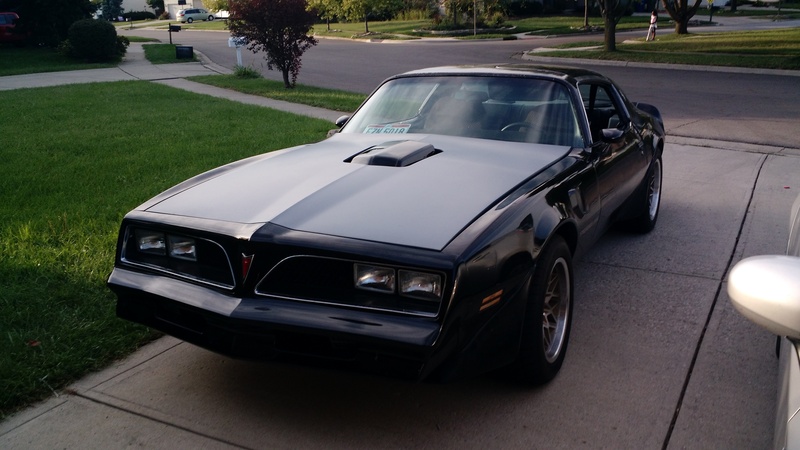 Trans Am painted!!! Thank you DCI Motorsports!!! 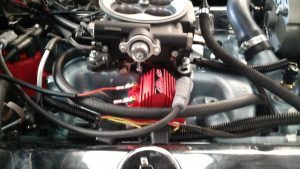 I finally got around to modifying my factory 1972 Pontiac Quadrajet spread-bore intake to accept the square-bore FiTech throttle body EFI. The results are in, the car runs smoother than ever and I can now mount my shaker to the throttle body using the factory air cleaner base! Note that these instructions are for modifying a Pontiac intake designed for a Quadrajet spread-bore carburetor. 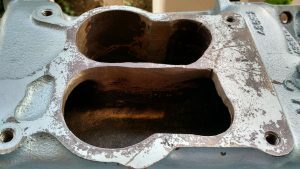 Modifying a spread-bore intake for other manufacturers will more than likely be slightly different. Please note that your intake’s runners may be positioned differently thus requiring different attention where to modify. 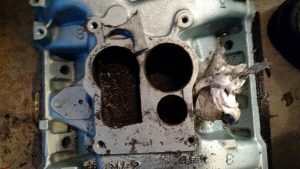 First, do not modify the intake on your vehicle! 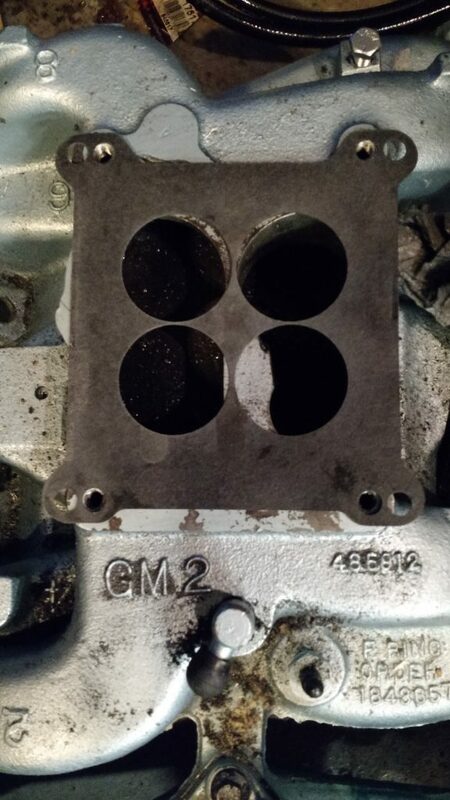 First think you need to do is remove the intake manifold. 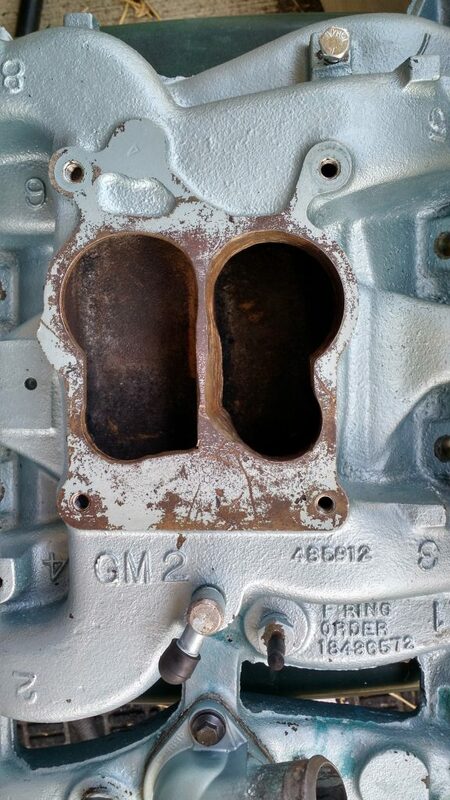 For a pontiac, this requires draining (or partially draining) the coolant enough that removing the intake does not cause drainage from the water crossover in the front of the intake. The draw-down bolt will also require you to remove at least the alternator and in my case, power steering brackets in order to access. I spent more time taking the intake manifold off and bagging/tagging everything than I did actually modifying the intake. You want to make cuts with the saw to remove as much material as possible taking into consideration that some locations you do not want to remove too much material and expose the other side of the intake. Remember these intakes are dual plane and the last thing you want is to poke a hole in the wrong location! First cuts ran along the outsides. 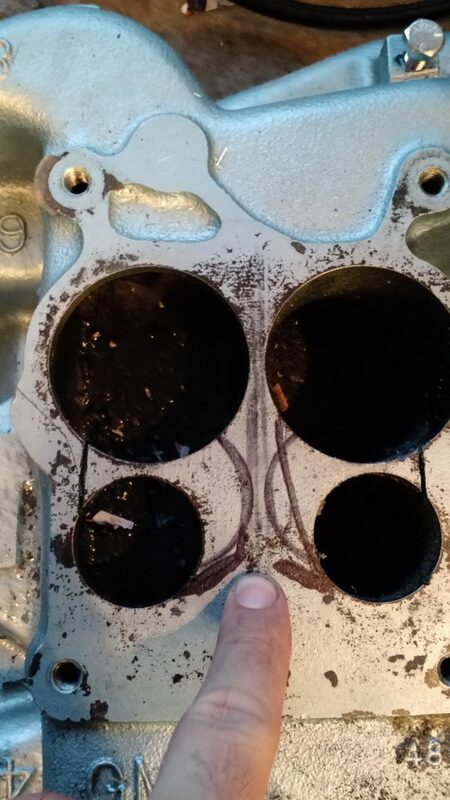 These cuts clear the outer most portions of a square bore gasket. The 3rd cut took place on the left side (right side if viewing from the drivers seat). This one pretty much opened the one side almost perfectly, requiring only some grinding to the secondary to clear the square bore gasket. 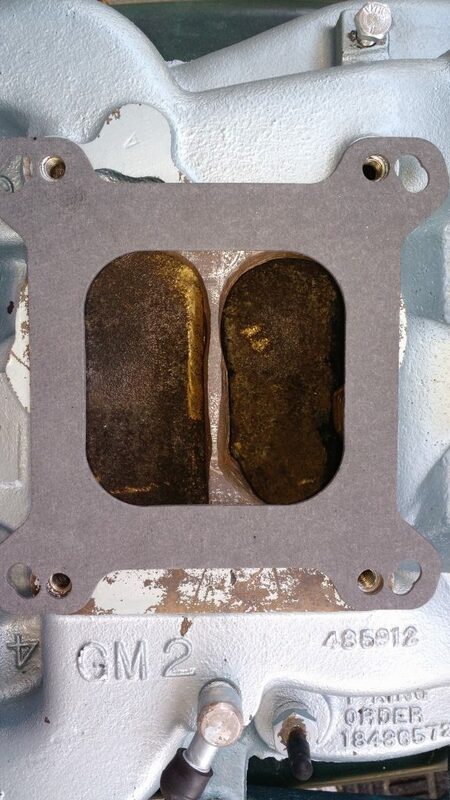 Here you can see using a square bore 4 hole gasket that only a small section of the secondary (top right of the left secondary and top left of the right secondary) needs to be ground down for clearance. The rest of the secondary openings are fine as-is. 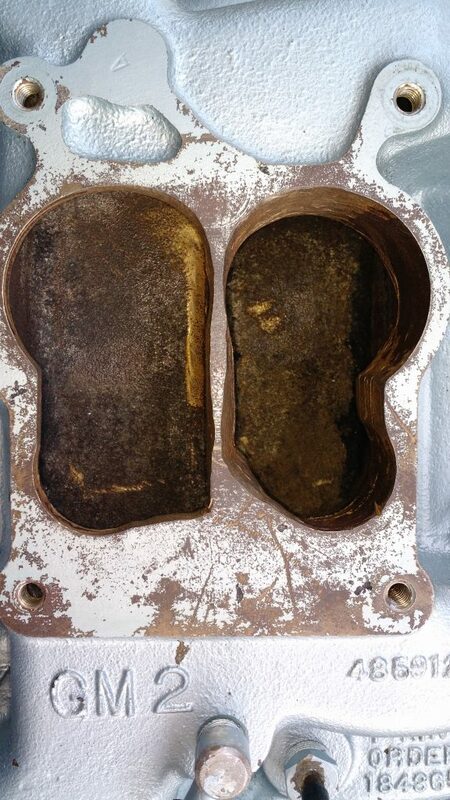 The right side of the intake manifold required extra cutting through thicker material. The second cut ran between the secondary to the primary. You may skip this cut if you have a steady hand when using your Sawzall. The remaining 2 cuts I did at thhe same time. Forming a V, I cut the remaining section between the primary and secondary as close as I could along the centerline of the intake. I was careful not to remove too much material as the walls to the intake runners from the other plane are very close in this area. With the die grinder carbide burrs I removed just enough material from thetop inner corners of the secondaries as well as smoothed out the areas along the center separating the planes of the intake. Once I was done I test fit the square bore single opening gasket to the intake. This is the gasket I will ultimately use with the FiTech throttle body. I will not claim to be a porting expert. I got the job done and all of the rough edges removed, I did not spend the time to remove scratches that I may have left along the walls. You could see them but feeling with your fingernail they were essentially not existent. 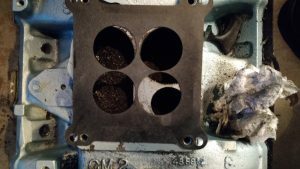 Once I was done, I washed the intake 3 times then followed the normal directions for installing the intake. The only thing I do that is sometimes not mentioned in manuals is use RTV sealer round the draw down rubber washer (this is the rubber washer that a new intake manifold gasket set will come with that goes between the intake and the timing chain/water pump cover) as well as around the water crossover ports that run to the heads. I am not a big fan of over using RTV sealer, I essentially used enough that when you torque the bolts down you just see a sliver of RTV squeeze out of the mating parts. If you see gobs of RTV sealer oozing out between your parts, then I think you’re using too much. When I set the intake in place, I just tightened the 10 bolts until they started to grab the intake. Then I torqued the draw down bolt to 15 ft/lbs. Following that I torqued the intake bolts from the center out to 15 ft/lbs, then 30 ft/lbs, then ending with 40 ft/lbs. Everything else I re-connected including the top radiator hose, fuel lines, and wiring for the FiTech. Modified Intake Results: Shaker fits perfectly! I can now use the factory air cleaner and shaker with the FiTech! During the process of pulling the intake manifold off the car and modifying it, I noticed that one of the 3 mounts for the Blaster SS Coil had ripped leaving the coil dangling in a not so desired way off of the firewall. 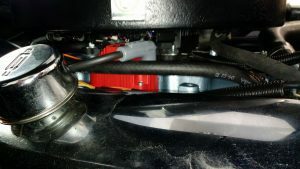 Even tough MSD claims you can mount the Blaster SS Coil in any way you like, I determined that the rubber mounts that the Blaster SS comes with are not up to the task of holding the weight of the coil in any other direction but vertically. At the last minute I created a new mount out of 3/16″ thick 2″ wide aluminum plate and fastened it to the choke side of the intake manifold. I am not sure I will leave it here since I think this creates too much heat in this location, but I will give it a try for a couple weeks at least. The Blaster SS coil clears the air cleaner by over 1/2″. This is plenty of clearance for me. My only concern is the possibility of heat build-up in this location, but it may be a good location since it is in the path of the radiator fan. Dude. all i can say as I did may of the things you have and my project is taking forever.. You actually have done more mods like efi and all. But I can totally relate to the pains or hassles of the build or in my case restoration with a small 1 car garage. At least i’m not alone. So close for mine its been almost 6 years just with cosmetics, welding partial quarters and paint and bodywork. Base coat black and clear. I have a true 78 4 speed that i changed to auto with a 455. Most of the things have taking alot of patience that I didnt think I had. Wow, I am jealous though I am glad I do not need to do any welding work, I wish I had a project that required it so I would get more experience with welding. Awesome to hear! Do you have a blog or website with pictures of your project? Angelo, great job man! I’ve been searching for an off-the-shelf solution to running EFI on my 428 in my ’77 Y82 T/A without bolting the shaker to the hood (NEVER!!!). This might be a great option to try! Thanks for the write-up and pics! Awesome! I wish I just modified the intake from the beginning, it took less time than it did to build a custom drop base and is a much more permanent solution. Did the airaid 801-452 fit with the factory air cleaner & shaker? Top site. Good question, I didn’t bother to try once I got the factory setup working I went back to a WIX filter. I still have the Airaid filter, when it warms up I’ll go in the garage and find out. It does fit. However, it does not hold the air cleaner base as well, the shaker can rotate unless you somehow key the factory air cleaner base the shaker can rotate. I hope this helps. How did you get the shaker and air cleaner to fit on the FiTech throttle body without touching? The factory air cleaner does not touch the FiTech. It is close but it doesn’t touch. The only spot that gets extremely close is at the fuel line inlet. I used a 90 degree 6AN fitting and turned that down and inward toward the center of engine so the factory air cleaner base clears it. I have pictures of testing the FiTech with the factory air cleaner base when I first got the FiTech: http://www.modsandrods.tv/2015/08/25/fitech-throttle-body-go-efi-4-installed-in-project-trans-am/ My quote from November of 2015 “I can just pass a sheet of paper between the drop base and the side of the FiTech where I believe the fuel return system is housed. 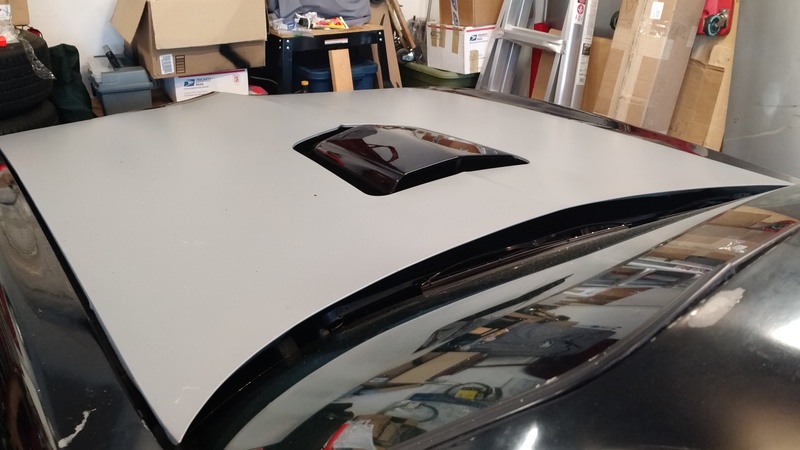 This test was without a gasket between the throttle body and air cleaner, which has given me a touch more space since I took these pictures.”. That test fit though was before I added a fuel line, hence my other reply that you need to use a 90 degree 6AN connector. You can see how I have it angled-in in the photos. Do you have a return line on yours? No, I am running the Fuel Command Center. It works great with my mechanical pump. The mechanical pump does however have a return line. I have never had the heat issues others have talked about with the Fuel Control Center, but I mounted mine on the core support, far from the engine.